"A Day with Mark Twain"
Text from ROLLINGPIN'S HUMOROUS ILLUSTRATED ANNUAL. NY, 1883. The boat that was to convey Mr. S. L. Clemens--Mark Twain--northward, was to leave St. Louis at four o'clock in the afternoon. It was now ten in the morning, and he proposed the interval be spent in driving about the city, and calling on some old time acquaintances. He had already arranged his toilet, and added an extra overcoat to meet the demands of a chilly atmosphere, when, running his hand over his face, he suggested the propriety of visiting a barber shop before entering upon the day's programme. During the tonsorial performance we carried on a rambling conversant about this trip south, which Mark declared had proved a dismal failure, resulting in nothing but some social interchanges. "I expected," he went on, "to travel incog. and return east loaded to the guards with solid information about the late flood, and other maters of interest concerning the people of the Mississippi river and the valley, but I was discovered the first day I arrived here from the east, and again when I took passage on the boat for New Orleans, and undertook to interview the boatmen. This confounded speech of mine betrayed me to the enemy; and just when the pilot on watch began to 'scape out' in the most beautiful fashion. No, it's all up. I'd have given worlds to have been permitted to pass unrecognized, and stand around and listen those matchless lies by the hour. But I'm in the hands of Providence, and I suppose Providence does not propose to suffer my morals to be corrupted in that way." As we emerged from the barber shop, Mark became impressed with the idea that he needed a pair of suspenders, and we at once sought a furnishing establishment for the purpose of making the necessary purchase. When a pair had been selected he divested himself of his three coats, and then removing his vest revealed still another wrap, which he at once began to describe as a suspender of his own invention, and which he said was not yet fully perfected in all the intricate minor details, but it soon would be. There was an ingredient yet lacking which had been formulated, and when supplied would make the suspender come into general use by every sensible man in the civilized and barbarous world. "That suspender," said Mark, holding it up and viewing it admiringly, "will yet hand my name down to posterity as a benefactor of my race. I'm the first man that ever gave his genius to the creation of a practical article of this kind--a garment calculated to fill all the requirements of physical health and esthetical culture. All the rest were idiots. I said when I patented by scrap-book, which cost me years of hard study and sleepless nights, that I would confer another blessing on mankind before I got under my monument, and I will. These buttonholes you notice have torn out, causing the pants to drop down and rest upon the hips. This objection is to be overcome by introducing a rubber band, which will yield to the pressure resulting from the various motions of the body, when the suspender will be ready to go before the country on its merits." The shop keeper suggested that the design was very simple, and reminded him of a primitive garment worn by small children, and called in nursery parlance a "waist." "The design differs radically," said Mark warming. "Don't you see here that the shoulder straps are only three inches wide, whereas they reach from the shoulder to the base of the neck in the child's dress. This is one of the points on which I rest my claim for a patent." Here Mark turned a patronizing look upon the vender, folded the garment, placed it in a pocket of one of his layers of overcoats, when we left the store. By-and-by we called a carriage, and giving the driver his directions, settled into our seats. During the drive the conversation ran on books, authors and literary topics generally. I suggested that his last book, "The Prince and the Pauper," was his best, and would outlive any of the others that he had written, notwithstanding some of the critics had been rather severe on it as a work of art. Any minor errors or anachronisms that might have unconsciously slipped into the first edition, I urged could readily be eliminated or corrected in a second. "Not a word will I ever change," was the prompt response. "I never undertake a piece of work until I have thoroughly prepared myself for the task, and when it issues from the press, it is done as well as I can do it, and that's the end of the matter." We then talked of the "Innocents Abroad," and "The Tramp Abroad," I maintaining that the later was equally as good a book as the former, though coming after it, could never hope to be so popular. "A much better book," said Mr. Clemens. "Twelve years ago I could not have written such a book from the same material." The conversation next turned upon humor generally, and the fatal mistake men of real ability have often made by permitting themselves to express their thoughts in this vein. Oliver Wendell Holmes, I urged, came near swamping a brilliant career by unconsciously falling into this error, and it required years of toil before he could emerge from the unpleasant predicament in which his youthful folly and enthusiasm had placed him; and it was not until the appearance of that matchless work, "The Autocrat of the Breakfast Table," that his true place in literature was acknowledged. Lowell's "Bigelow Papers" stamped him as a man of genius, and the most original of American humorists; but fun and satire, though wielded by a master hand would never have brought him sufficient standing to have sent him as our minister to the courts of Spain or Great Britain. A quarter of a century had to elapse, and the interim filled in with solid work and solemn repentance, before honors such as these could be aspired to. Tom Corwin, one of the most erudite of lawyers, whose wit was as brilliant as his scholarship was profound, and his patriotism undoubted, fell into a similar error, and placed forever a barrier against his advancement to the highest position in the gift of the American people when he condescended to instruct and amuse by the employment of the lighter vein. And so we might run over the long list of brilliant men who have suffered from a like cause. And Mark Twain cannot hope to be made an exception to general rule. He recognizes the inevitable, and bows to it with the resignation of the true philosopher. With all his vast store of common sense and practical capability, he is expected ever to appear in his cap and bells and do the risible. 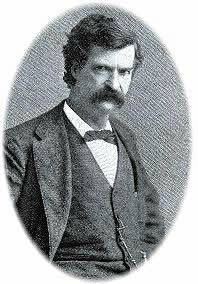 Such a fame as that which he enjoys it would seem should be sufficient to gratify the ambition of any reasonable person, but Twain is too sensible a man not to realize that humor, of all things, is the most ephemeral, and that which will convulse the world to-day, will appear flat and insipid enough to-morrow. A quarter of a century ago, Doestick's fame was world-wide, and his writings in everybody's mouth; and yet who reads Doesticks now. To take up one of his books one wonders why anybody ever did read him. In all h is writing there is not to be found a single piece of word painting that cries for recognition and a permanent place in the book stalls. But, Mark Twain is a man of real parts, and much that he has done will live. He is endowed with strong common sense, steadiness of purpose, judgment and an insight into human nature, which, if cast in other fields than that which he adopted, would have fitted him for the broader and higher walks of life. No once can read him for an hour without being convinced that while he is a humorist of the first order, that he is something more. There is a breadth and depth of philosophy about his most mirth-provoking pictures, which might be profitably employed in directing the practical every-day affairs of life. In personal appearance S. L. Clemens is of medium stature, standing rather wide on his legs, and moving about with a careless, swaggering gait. His head is large and well-formed, and may be termed of the massive order of architecture, being well-poised, and having a firm-set chin, which indicates steadiness of purpose and plenty of stay power. The nose is slightly aquiline, thin and pointed at the extreme. The face is smoothly shaven, with the exception of a sandy mustache. Hair slightly gray. He speaks with a drawl and in measured accents, his ideas at times seeming to run into confusion, when all at once his eyes flash with light, when his mind rallies, and he carries his point with vigor. "Yes, the weather is bad, and if I were dealing in weather it is not the brand that I'd put up in cans for future use. No, it is the kind of weather I'd throw on the market and let it go for what it would fetch, and if it wouldn't sell for anything I would hunt up some life-long enemy and present it to him. Failing in this, as a last resort I should probably take it out on the big bridge, dump it into the Mississippi and start it to Europe via the jetties. I'd unload it someway, and that quickly, too." On the trip south on the steamer Gold Dust, Mark went up into the pilot house and entered into conversation with the pilot, for the purpose, as he himself expressed it, of enjoying some good, old-fashioned, unadulterated Mississippi river lying. The pilot answered all interrogatories with an ease which proved his fertility of resources, while Mark's private stenographer proceeded to take down every word for future use. Questions about the late floods, the changes of the river, and all such matters, were put and satisfactorily answered. At length the conversation turned to piloting, when Mark ventured to inquire of the man at the wheel if he knew Sam Clemens, who at one time was reported to be a pilot. "What! Mark Twain?" said the other. "Yes, that's what they call him," was the rejoinder. "Well I should say I did! Sam left here 'bout twenty years ago, an' has been writin' books ever since. He's better at that'n he was steerin,' for he wasn't much of a pilot. He'd just as like as not go to sleep on watch and run the boat into the bank, head on, if you didn't keep a watch on him. If thar was a snap in the river he'd go miles out of his way to get a whack at it, and was never happy unless he was bouncin' somethin'. Why, you'd think he was getting' the biggest kind of money from the government to clear the river of snags if you'd seed how he hustled 'em out of the way." "Do you remember his personal appearance?" "Who? Sam Clemens? Yes, I should say so." "What was it?" "Wall, sir, to tell you the truth, to look at Sam Clemens, he wasn't worth sweepin' up!"